It is hard to believe that three months ago three other interns and I started this internship when the corn was just emerging from the ground and some was not even planted yet. I remember our very first task as interns was to spray-paint dots across the ranges of several fields in the pollinating nursery. We painted a dot at the beginning of each plot so we would know where to go back and plant “delay” plots. These plots were planted later than the majority of the field so all of the corn would not be ready to pollinate at the same time. It was also a way to ensure access to viable pollen later in the season when most other tassels would be done shedding pollen. These delayed plantings were spread out and a few plots were hand planted each day according to how many degree days were recorded in the New Holland area. We spent our last couple of weeks at the station collecting data and cleaning up from the pollinating season. A lot of time was spent collecting silk and shed dates. To do this, we walked through a field in pairs and recorded when a plot started silking or shedding. Many plots we looked at were one-row plots which made it easier for data collection. A plot was “silking” if at least half of the plants in the plot had ear shoots with silks emerging from them. A plot was “shedding” if at least half of the plants in the plot had tassels currently shedding pollen. We also collected plant and ear height data. Using PVC pipes with inch marks up the side, we recorded both of these heights. The ear height was the height of the plant up to the base of the topmost ear. Plant height was the height of the plant up to the base of the top flag leaf. A considerable amount of this was done at the home farm and at many surrounding locations, just as hoeing and stand-counting had been done two months earlier. During the last week at Pioneer New Holland, the other interns and I got to go on a field trip with the station supervisor down to DuPont’s headquarters in Wilmington and Newark, Delaware. We saw where a tremendous amount of research is done relating to crop development, protection, and resistance. We were given a tour of the facilities run by a Pioneer team working within DuPont to improve soybean varieties. We saw their office, lab space, growth chambers, and greenhouses. We got to see a much bigger side of the company we had been working for all summer. We heard about how the data we collected in the field was entered into a data collection system that could be viewed by Pioneer researchers at the Delaware facility and at other facilities as everyone collaborated and worked together to create a better product. This information helped to bring our summer work full circle. This was a great summer internship in many ways. I would recommend this internship to anybody interested in the research side of a company like Pioneer and also to those who like to work outside. I met great people who are passionate about what they do and who were willing to share what they knew with us. 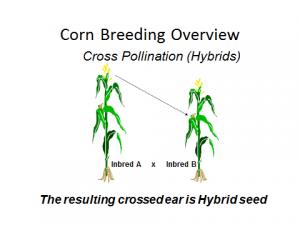 While we spent a lot of time in the corn field collecting data and completing repetitive tasks, it was all necessary for the plant breeders to determine what is working in a new hybrid or inbred, and what is not. I now have a greater understanding as to how a seed research station works for a large company like DuPont Pioneer. I have a deeper appreciation for the amount of time, money, labor, resources, ingenuity, and determination it takes to create a modern corn hybrid. July means pollinating season at Pioneer New Holland. The home research farm is broken up into three major sections. One section is the pollinating nursery, one section yield testing, and one section disease testing. All of the hand pollinations occur in the pollinating nursery at the home farm. 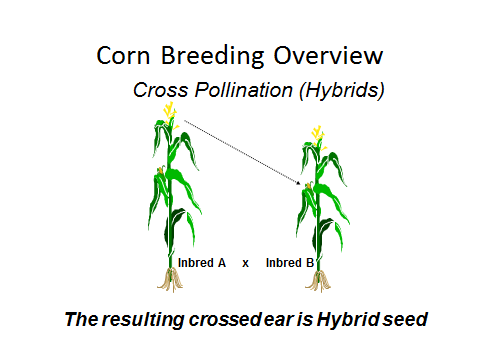 The plant breeders who wish to cross some in-bred corn lines for the first time, or who want to self in-bred lines to reproduce similar material, have to control where the pollen goes from one plant to the other. When performing a self-pollination, pollen from the tassel of a corn plant is placed on the silks coming out of the ear shoot of the same plant. 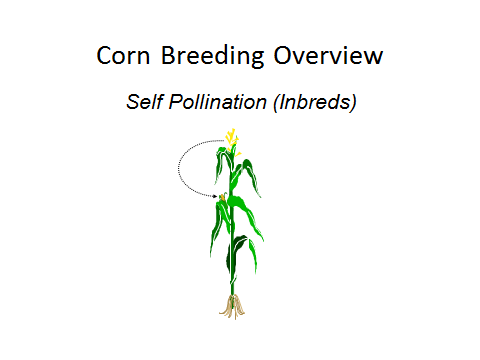 A cross pollination is done by taking the pollen from one plant and placing it on the silks of another plant. To help with this work, the station brings in about 50 high-school kids to help with the hand pollinations for the 3 to 4 week long season. A big tent is set up with tables for lunch and break times. Porta-Potties, hand-washing stations, tables with water coolers, and trash cans are placed throughout the property to accommodate the extra workers. 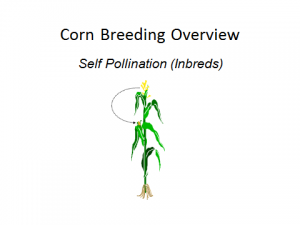 During the peak week of pollinating season, upwards of 10,000 pollinations may be done in a day. The “pollinators” as they are called arrive by 7:30 am and work until 3:00 or 4:00 pm. The interns start a little earlier as we were on water detail. The kids break into groups of 10 and each research assistant becomes a crew leader. The interns fill in as needed, helping pollinating crews, bringing supplies, helping set up and clean up. We also had a good bit of other data collection to do during this time so that kept us fairly busy. Each day, the pollinators would go through a three step process. First thing in the morning, shoot bags would be placed on the emerging ear shoots. In a few days when the silks emerged, they would not be exposed to any pollen flying around in the open air. Second, everyone would “set up” on the tassels of plants. This involved placing a tassel bag over the tassels that were already shedding and losing anthers and pollen. Finally, the plants that were “set up” on the day before are “taken down” today. Tassel bags are taken off the plant after being shaken to capture more pollen. They are placed on the silks of the same or a different plant after the ear shoot bag is removed. The tassel bags with the pollen in them are then shook over the ear shoots and fastened around the stalk so as not to expose the silks or pollen. This is how pollinations are done and repeated over the entire pollinating nursery. In crossing blocks, pollen is taken from one set of male plants to another set of female plants in a different block. A lot of pollinations were done in three short weeks. We accomplished a lot with all of the help we had and we had excellent working weather. Though the corn might have liked it a little hotter, we were fine with days in the low to mid-80’s with average humidity. A gentle breeze made things all the better. It was interesting to learn how the pollination process worked. This is how the plant breeders create more seeds to work with in the future, to advance their research projects and improve current hybrid varieties of corn. 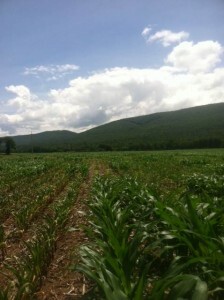 As the corn matured in the month of June, we took more stand counts and did a considerable amount of hoeing and staking. What we did at the “home research farm” in New Holland, we often had to do the same at other research locations as well. We would often load up the van with hoes and boxes of stakes and take off for a plot that could be a few miles away, could be in a neighboring county, or could be three hours either north or south. On longer trips, we left the research station around 7:00 am and returned around 5:00 or 6:00 pm, usually after most other employees had returned home. We did not complain however, as we got to take a nice nap on long rides, and lunch was also provided. For each research field, there is set number of plots and a specific layout for these plots. 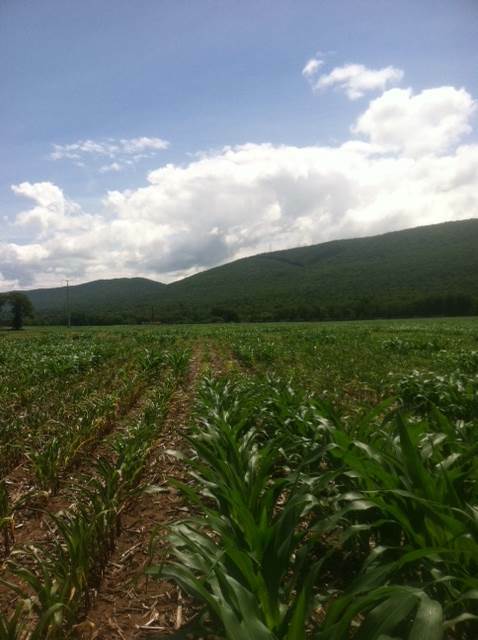 Each field is generally rectangular and surrounded by border rows of corn to act as a buffer. A standard commercial variety is usually used for these border rows. 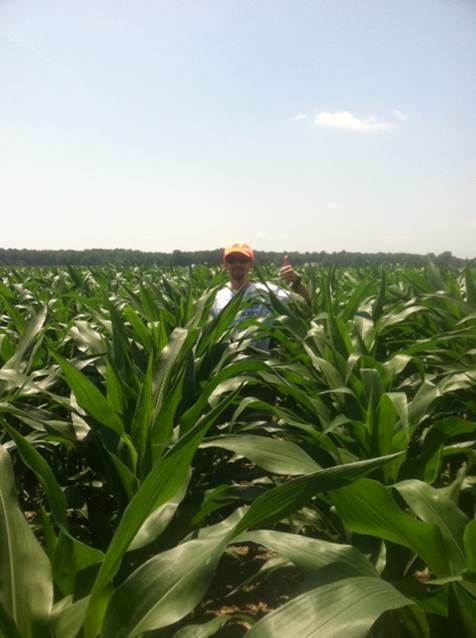 The test plot size is either two or four rows wide and is anywhere from 10 to 17 ½ feet long. The field is divided into ranges and plots. Ranges run horizontally and rows run vertically if you are oriented at the correct end of one of the fields. Stakes were placed in certain ranges as specified by the breeders so they could identify the location of each of the plots as the corn grew. The plant breeders and research assistants could then more easily collect their data. Hoeing out volunteer corn and the occasional hemp dogbane weed was another adventure all by itself. The other three interns and I probably hoed between 30 to 40 acres of the home research farm at least once. We hoed at most of the surrounding test fields close to New Holland. We hoed down south in Delaware. We hoed up north around Williamsport, PA. In the month of June we hoed like it was going out of style. Two more memorable hoeing trips stick out in my mind. Once down in Delaware on a 96°F day, we were hoeing a field that had been planted but much of the seed was eaten by birds. The field was then tilled up and re-planted, but some of the first round of corn that had not been eaten was still coming up. We were hoeing out what was originally good experimental test material, but it was now in the way of the re-planted test material. 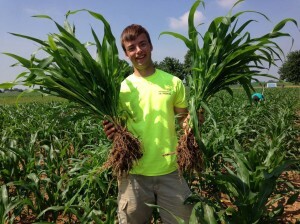 We were not hoeing pesky volunteer corn, but stuff other research assistants had planted three weeks ago! Another memorable hoeing trip was just down the road from the New Holland station. It was another 90°F day in a field that had been subjected to lodging and stalk strength testing in the previous season. To test the stalk strength of each plot, they take an apparatus consisting of a few metal bars and “push” the corn over, seeing which plots withstand this best. Usually most of the corn ends up on the ground. Before the next corn test field was planted, the ground was tilled, creating a perfect environment for those buried kernels to germinate. We were left to hoe out clumps of 5-10 corn plants popping up all throughout the rows of experimental plots. To say we had a small volunteer corn problem would not accurately describe the situation. Some of the volunteers were taller than the actual “good” corn and at times we could not tell where the actual rows of experimental corn were as we were on our hands and knees pulling the stuff out. All in all though, good bonding experiences with our fellow interns and the other research assistants. 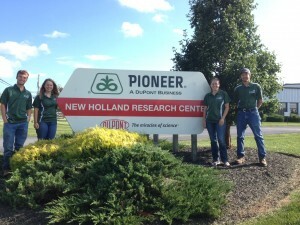 This summer I work with three other interns at Pioneer New Holland. Two of them are majoring in agriculture, one at Penn State University and another at Delaware Valley College which is also in Pennsylvania. The fourth person is actually a temporary employee that they hired on full time for the summer. Whatever task we may be assigned to do for a particular day or week, we generally all work together or at least in pairs. This is a nice change from last year when I was the sole new person at my summer job. 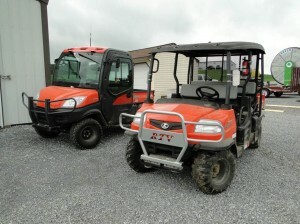 We often run around the “home research farm” on a Kubota RTV like the ones pictured. We have fun as we take stand counts, hoe volunteer corn, or put stakes out. Taking stand counts involves counting the number of healthy looking plants in a given plot that are likely to mature and yield adequately. We walk through the field and count the plants using counting sticks, reporting the number of plants to one of the research assistants following us. She records our numbers in a data collection program on an I-Pad. We go down through the field counting and shouting off numbers so the plant breeders know which plots have adequate stands and which plots do not. Included are some shots of the crew taking stand counts on the Delmarva Peninsula near Salisbury, MD. 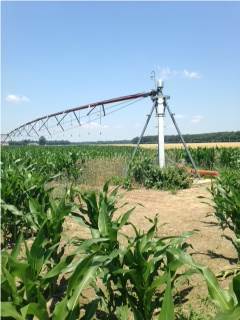 There are two things on the Delmarva Peninsula which we do not have much of in Lancaster County: irrigation rigs and beach-sand soil. 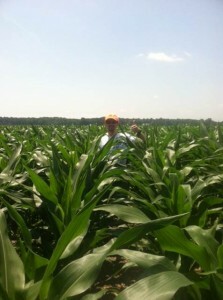 Also, while the corn in Lancaster was knee high in mid-June, it was chest high down there. 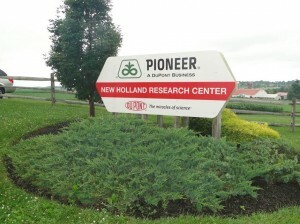 At Pioneer’s research station in New Holland, there are two plant breeders and one plant pathologist. These three people are in charge of all the experiments and studies at the station. 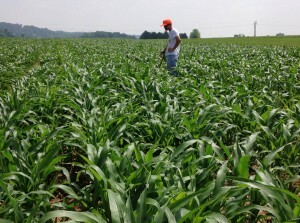 They run experiments in different corn plots trying to improve traits in both varieties of corn grain and corn silage. Helping the breeders maintain their experiments are about half a dozen research assistants that oversee the day to day tasks of collecting data and maintaining the plots. There are also several guys that work out in the equipment shop, operating and maintaining all field equipment and vehicles, as well as keeping the fields and ground up-kept. This makes up the daily working crew at the experiment station in addition to some administrative staff. 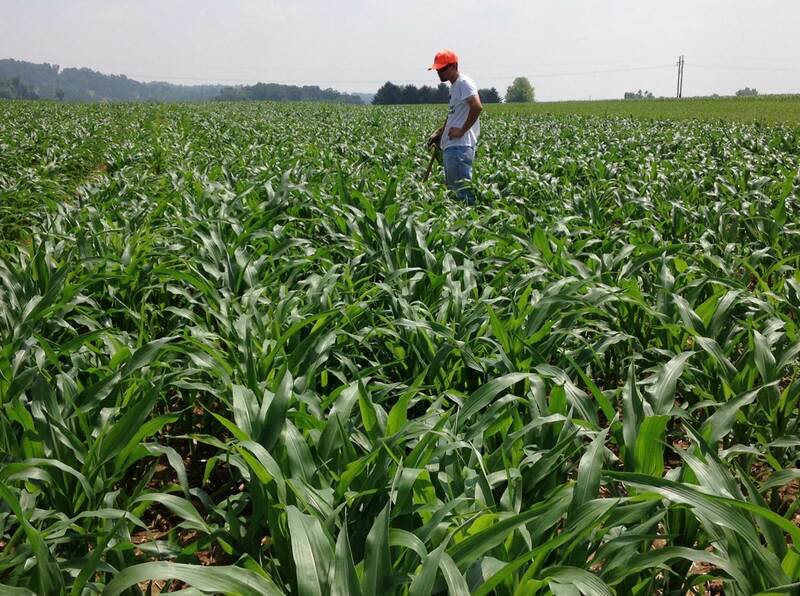 At this research station, the staff are currently working to improve yield, disease resistance, nutritional quality, and stand-ability including stalk and root strength. Two big diseases that are prevalent in corn in the north-east that they are working to improve resistance against are Northern Leaf Blight and Grey Leaf Spot. Also, as Pennsylvania and New York make up a large dairy region in the north-east, trying to increase the nutritional quality and digestibility of corn silage is an important aim for at least one breeder at this station. A relatively new corn silage variety called “BMR” standing for Brown Mid-Rib is a type of corn that has less lignin, making it more digestible to the cow. The other interns and I can easily identify this out in the field as the mid-ribs of the leaves are indeed brown. This summer my internship is taking place at DuPont Pioneer’s corn research station in New Holland, Pennsylvania. This is one of Pioneer’s only corn research stations on the East Coast. They have about 50 acres of field corn test plots on site. 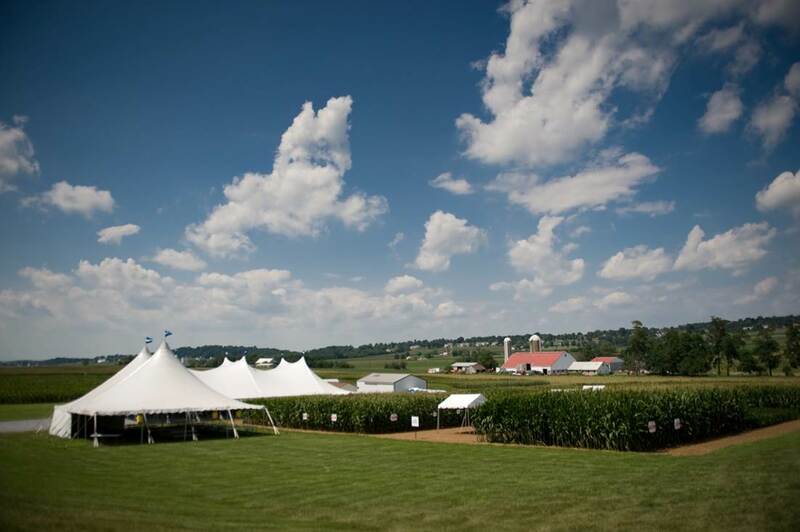 Many other plots are located nearby in surrounding counties in southeastern Pa. Some plots are located in Maryland and Delaware as well. 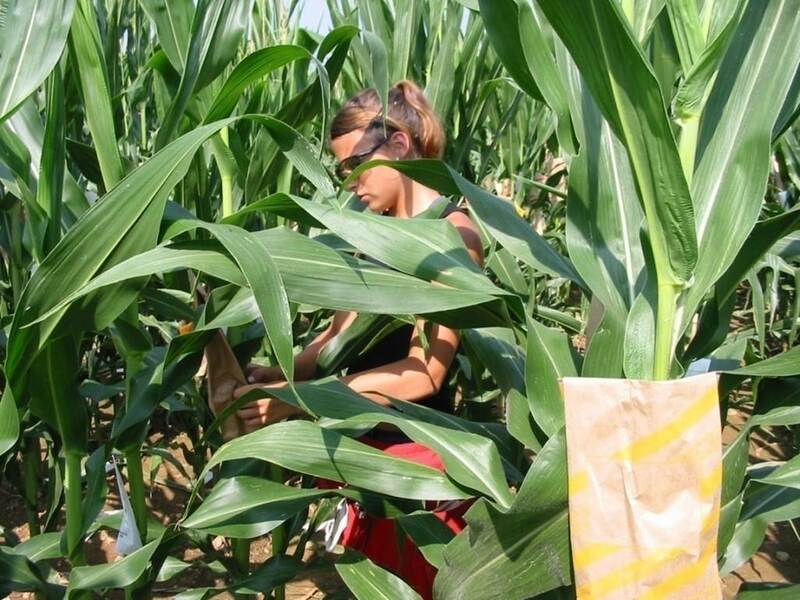 At this station the researchers and their assistants run experiments to test and improve Pioneer field corn varieties for both grain and silage. Four interns are hired in the summer to help maintain the corn plots, collect data, and help facilitate the pollination season. I started work and we were put on a “fast-track” to learn all there was to know about a corn research station. We started at a busy time as corn planting season was in full swing. In a normal year, by the time we would have started helping Pioneer, much of the planting would have already been done. Since it was a wet and cool spring, there was still much to plant when we arrived. 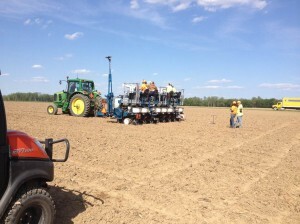 In our first few weeks we helped sort seed in preparation for planting, hand-planted individual plots of corn, and rode on the corn planter to plant the big field trials. They plant the corn using a Kinze 8-row corn planter with 8 riders. Everybody had a headset on so we could communicate with each other over the noise of the tractor and vacuum system on the planter. Each person was responsible for dumping different seed packets in one row. Some of the plots they plant are only several feet in length and are either two or four rows wide. Therefore, we traveled at about 1 or 2 mph across the field and dumped a packet of seeds in every 6 seconds to the sound of a timed and automated buzzer. After all of the corn was planted we helped clean up and organize the seed storage and inventory room inside the main building. We spent several rainy days re-organizing seed packets and making an inventory of what they had and what they wanted to keep for next season. Some of what we inventoried would eventually be sent to other research stations. When it is winter in Pennsylvania, seed from Pioneer’s experiments are sent from the New Holland station to other research stations in Mexico and Hawaii, where corn can be grown during those times. This way the experiments and studies continue throughout the calendar year. Also, some of the seed the researchers did not want to keep was discarded in bulk seed bins to later be incinerated or by some means destroyed. These are a few of the things the other interns and I have done and a few of the aspects of the seed research business that we have learned about. It is bound to be an interesting experience as I continue to work for Pioneer.